Over the last 15-20 years it has become obvious, that communication in our society has changed dramatically and will probably change more in the future. While many of the traditional means of communication are being used much less than they used to, modern forms are evolving more quickly than ever before. One term that is omnipresent in today’s discussions about communication is “Social Network”. Most people are quick to drop that term, but the majority of them presumably does not know what it means exactly, or where it comes from. What is a Social Network? How can a business make use of it? How do Social Networks influence the actions of companies and how can companies take advantage of Social Networks when leading staff and when doing marketing? This term paper aims to reveal the meaning of Social Networks and Social Network Analysis in today’s corporate culture. 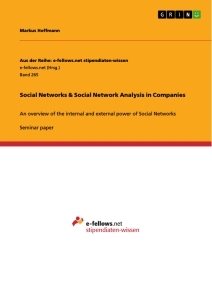 The first part of the paper will examine the meaning of Social Networks and Social Network Analysis in companies, more specifically how Social Networks manifest themselves in companies, what common problems there are and how managers can take advantage of Social Networks and steer corporations from inside. The second part discusses the question of how companies can develop and maintain social capital and take advantage of Social Networks among their customers to increase their profit. This paper is basically divided into two main parts. In the first part a brief overview of the topics history is given, and the term “Social Network” is explained. From part 2.3 onwards the meaning of Social Networks in companies is explained, also the most common problems and some methods which can help managers to take advantage of Social Networks are mentioned. While part one is about the internal power that Social Networks can have, part two is about the external power of Social Networks which can be used to attract customers. The second half of the paper also gives an overview of the most popular applications of Social Networks in marketing. The problem with mainstream social research is, that it only focuses on the individual research object as such, not on the ties that connect one individual to another. It neglects the social part that is concerned with the way individuals interact and the influence they have on one another (Barton, 1968). This is where structural research comes in. Structural Research is not only limited to social studies, it can be found in many different fields of science. Biologists, for example study the ways in which each of the species in an ecosystem interact with one another and physicists study the gravitational attraction of each planet in the solar system on each of the others (Whitehead, 1925). Structural Research in the social studies examines links between subjects and not the subjects themselves. This is what is usually referred to as Social Network Analysis. Castells offers a more technical approach to the subject. In his opinion, a network society is a society whose social structure is made of networks powered by microelectronics-based information and communication technologies. Social structure is the organizational arrangement of humans in relations of production, consumption, reproduction, experience, and power expressed in meaningful communication coded by culture. A network is an interconnected set of nodes, which has no center. A node is, for example a worker and the network is a company. The importance of a node is not directly related to its specific features, but to its ability to contribute to the network‘s goals. When nodes become useless, networks tend to rearrange themselves (Castells, 2004). This is also one of the reasons why networks, in some situations, are superior to classical hierarchic structures. The idea of examining social ties is very old. For example, descent lists can already be found in the Bible. But it has only been less than a century ago that Social Network Analysis as we know it today has been invented. Before that, social researchers mainly kept to one, or a combination of 4 approaches. These 4 approaches are also part of what we know as Social Network Analysis today (Freeman, 2004). One of the most important figures behind the development of modern Social Network Analysis was Moreno. Moreno was born in 1889 in Bucharest and after graduating from the University of Vienna Medical School as a psychiatrist in 1917 he moved to New York. Together with his partner, Jennings, Moreno conducted sociometric studies at Sing Sing Prison (Moreno, 1932) and at the Hudson School for Girls (Moreno, 1934). Both studies involved systematic data collection and analysis, and the term “network“ was first used in his 1934 book as it is used today. Moreno described that sociometry was based on an “... experimental technique obtained by application of quantitative methods“ (Moreno, 1934). This is the first time that structural research has been used to conduct social studies, as is the case in Social Network Analysis today (Freeman, 1992). Another early research effort in the field of Social Network Analysis came from Harvard University, especially from Warner and Mayo (Scott, 1992). After one earlier research effort in the City of Newburyport, MA, Mayo and Warner started to do research on the social organization and structure at Western Electrics, then a subsidiary of the Bell Telephone Company in 1928 (Mayo, 1933). The research, which was done there was quite sophisticated. It embodied three of the four elements found in today’s Social Network Analysis, only the use of mathematical tools was missing (Freeman, 2004). Following the work at Harvard, no major research was done in Social Network Analysis for a longer time. This led to the field getting scattered in a large number of competing “schools“ of Social Network Analysis (Mullins & Mullins, 1973). It was in the 1970s that the field became more fragmented. The first major meeting of international social network researchers was held at Dartmouth University in 1975. The 1980s and 90s witnessed the integration of the several “schools“ of Social Network Analysis, which led to the creation of the intellectual and social community which exists in the field nowadays. Today, the field of Social Network Analysis is booming, and social scientists along with mathematicians and physicists have embraced the structural perspective (Freeman, 2004). If you take any given company today and talk to anyone from simple production line workers up to top executives, you will be told one thing. The boxes and lines of an organizational plan do not have much to do with the actual way of how work gets done in organizations. But everyone will be quick to acknowledge the incredible influence that networks of informal relationships have on work. So, these invisible webs between workers on all different corporate levels have become crucial to performance, learning and innovation (Cross & Parker, 2004). Nevertheless, most managers seem not to take advantage of those networks. They consider it impossible to know what is going on in the depths of an organization. Many executives also seem to think that network health is a product of information. But this is not necessarily the case (Cross & Parker, 2004). Getting an accurate view of a network can help with managerial decision-making, and it can also give managers the possibility to steer a company from the inside. What managers normally do when they feel that collaboration in their companies does not work the way it is supposed to, is pursue initiatives that aim at creating more communication between employees. What must not be forgotten is that communication is expensive. Employees getting overloaded with e-mail, meetings, and other requests are not productive and cost a company money. Rather than create connections between employees arbitrarily, managers should try to reveal patterns of connectivity in divisions and business units and try to understand how social networks in their companies are organized. This is where the power of a network perspective really lies. There is tremendous diagnostic value in understanding how work is getting done, and there is consistent evidence that well-managed network connectivity is crucial for performance and innovation (Cross & Parker, 2004; Shah, 2010). In every organization, there are people who stand out. These high performers are not just people who are smart, they have something more powerful but also harder to measure. To have the right idea at the right time does not make employees stand out. What makes this people different and at many times superior to their colleagues is the ability to convince others of their ideas. By their coworkers these people are often described as being able to create energy and support for initiatives they are involved in (Cross & Parker, 2004). Anyway, it is not enough for an organization to have outstanding employees. Managers should try to create and encourage networking between all employees, commitment and involvement. In a business world, which depends largely on social environments and knowledge spillovers, this activity can accelerate the growth and increase the productivity of an organization (Shah, 2010). One way to determine if employees are involved with their coworkers is by using Social Network Analysis. The goal in this particular field is to analyze relationships inside organizations and to identify them as energizing or de-energizing. Knowledge about energy in their organizations can be very beneficial for managers. They can determine which projects generate the most enthusiasm, and thus are the most likely to be successful, they can find out which people motivate and inspire others the most and they can also determine whether, or not reorganizations or other changes are having the desired effect (Cross & Parker, 2004). A compelling goal: Energy is typically produced from a focus on possibilities. Those visions should be worthy of people’s time, but not overwhelming. Conversations about infeasible projects are regarded to be highly de-energizing. A manager should try to find a goal that is realistic, but also compelling and inspiring (Cross & Parker, 2010). The possibility to contribute: Typically, there is a strong correlation between the motivation of employees and their belief that their efforts will make a difference. Energizing managers create opportunities for people to enter conversations in ways that make them feel heard and are not blinded by their own views (Cross & Parker, 2010). A sense of engagement: Energy accrues as people simultaneously contribute to a conversation and hear the insights of others similarly engaged (Cross & Parker, 2004). Social Environments depend on this involvement. However, some tasks may require higher commitment to an organization or an idea than others do. That is why it is important to understand how engaged employees are. Conversations can be one way to determine that (Shah, 2010). Motivated and engaged people typically bring themselves fully into a conversation or interaction. They do not let their minds wander to topics that are more interesting to them and so signal a lack of interest (Cross & Parker, 2010). The perception of progress: Energizing conversations need to feel as if they are leading somewhere. Managers should be driven to a goal, but at the same time open and flexible regarding other people’s ideas (Cross & Parker, 2010). The belief that the idea can succeed: People become energized when they take part in an interaction and when they let themselves become excited about the possibilities instead of seeing the things that could go wrong (Cross & Parker, 2010). Energizing managers try to abide by those points. They speak their minds rather than hiding behind “political behavior“ and they do what they say they are going to do. Especially in settings, where managers cannot engage others with authoritarian approaches, these dimensions are critical for success (Cross & Parker, 2004).